Thomas Rhett Akins, Jr. (born in Valdosta, Georgia) is an American country music singer known professionally as Thomas Rhett. He is the son of singer-songwriter Rhett Akins. 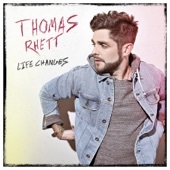 Here is some background information on Thomas Rhett from the Something To Do With My Hands Songfacts. Thomas Rhett grew up in the music industry by means of his singer-songwriter father Rhett Akins. Whilst studying business and communications at Lipscomb University in Nashville, Rhett formed a cover band and began playing frat parties and other gigs they could get.